All the pieces of your body simultaneously work together to ensure you’re in good health. If your skin is clear, muscles are strong, and blood levels are accurately balanced, your body is most likely letting you know you’re healthy. Yet, on the contrary, your body also has a knack for telling you when something has gone awry—and your nails are no exception. Your nail’s pigmentation, texture, and shape give clues to your body’s overall health. Sometimes, these are simple signs to remind you to cut back on the acrylics you get at the nail salon. But other times, these are signs that something more severe, like skin cancer, may be impacting your body. Medical dermatology encompasses the evaluation and diagnosis of diseases related to the skin, hair, mouth, and nails. Over the years, we’ve seen a wide range of nail conditions in our patients, so regardless of what your nails say about your health, we can help. Follow along to learn what common abnormalities we see in nails, what those abnormalities say about your health, and how to handle your correlated symptoms. Pale nails: What do they say about my health? If you’ve had pale, white nails throughout your entire life, it most likely means nothing—it’s just the way your nails look. However, if your nails become lighter over time or later in life, it may mean something bigger is happening throughout the rest of your body. One of the conditions we see associated with pale nails is anemia. Anemia is a blood disorder that deprives your body from the appropriate amount of oxygen. Typically represented by low levels of iron and low counts of red blood cells, anemia can cause your skin to become pale—and specifically cause the tissues under your nail to appear white and ghostly. When caught in its earlier stages, you can reverse your symptoms by making sure you get the appropriate levels of iron. By taking supplements and eating iron-rich foods, such as leafy green vegetables, beans, whole grains, and meat, your symptoms will improve. Pale nails can also represent the precursor to diabetes. As an outcome of high blood glucose, diabetes can lead to impaired blood flow, which ultimately results in pale skin and nails. When detected early, diabetes can be reversed with dietary changes. In addition to anemia and diabetes, pale nails are also a common detection of liver disease. Liver disease impairs your blood flow and, in turn, deprives your nails of their natural color. 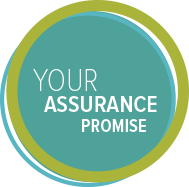 Due to the potential severity of liver disease, a trip to your doctor for testing and accurate diagnosis is a must. Why are my nails turning yellow? Yellow nails can be due to aging, smoking, or excessive application of acrylic nails. However, the most common source to yellow nails, causing about half of all nails disorders, is fungal infections. Fungal infections, also known as onychomycosis, initially appear as a yellow spot under the tip of your fingernail or toenail. As the infection worsens, the yellow spot spreads. This causes your nail beds to retract, thicken, and crumble at the edge. In most cases, fungal infections are completely harmless. However, if your impacted nail begins to cause you pain, release a foul odor, or leave you feeling self-conscious, self-care steps and medications can help. These are our top recommendations for at-home treatments. However, studies show that even with a successful treatment, fungal infections can often come back. If your infection isn’t subduing to these self-care steps, we suggest consulting your nearest dermatologist for an expert’s opinion. My nails are dry, cracked, and brittle: What does this mean? One cause to weak nails includes coming in contact with harsh elements on a regular basis. Products, such as nail polish removers and harsh soaps, can gradually deteriorate your nails. To reverse these symptoms, try staying away from acetone-based nail polish removers and wearing protective gloves while washing your dishes. In addition, taking biotin, an over-the-counter supplement, has been proven successful for correcting damaged nails. On a more severe note, if cracked, dry, and brittle nails are an ongoing problem for you, hypothyroidism could be the cause. Hypothyroidism is a condition in which your thyroid gland produces very low levels of thyroid hormones. Early symptoms of this disease include dry and thin nails or hair, fatigue, weight gain, and muscle pain. If you’re experiencing any of these symptoms, contact your doctor immediately. Why do I have ridges on my nails? Ridges refer to the presence of tiny lines or grooves in your nail bed. They’re commonly represented by vertical or horizontal lines and can be caused by a multitude of factors. Onychorrhexis, the medical term for vertical ridges, are small lines that run up and down the length of your nail. The most predominate cause of vertical ridges is aging. However, other causes of this nail abnormality include nail injury or trauma. On the contrary, horizontal ridges on your nails are represented by transverse depressions. Also known as Beau’s lines, horizontal ridges are caused by conditions that affect your entire body. My nails have dark lines: What does this say about my health? 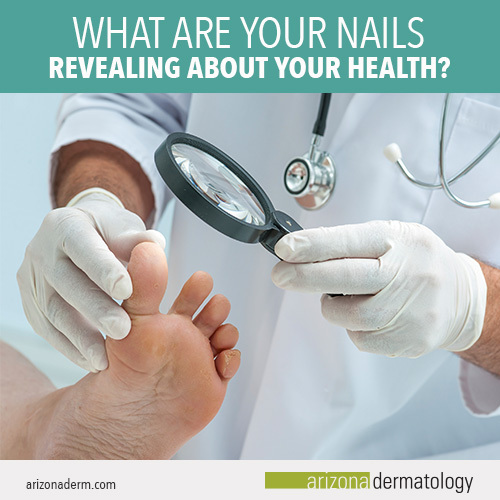 At Arizona Dermatology, the most crucial nail abnormality we look for are dark lines that appear on your skin, just beneath the surface of your nail. This irregular nail condition can be a sign of melanoma, the most dangerous form of skin cancer. Predicted to impact over 76,000 individuals this year, melanoma is a condition that should be diagnosed immediately. If you’re experiencing dark lines underneath your nails, contact a dermatologist as soon as possible. Some nail abnormalities are harmless, while other changes in your nails may represent the precursors of serious health conditions such as liver and heart disease, diabetes, or skin cancer. These serious conditions should be appropriately treated upon discovery. Although these are the most common conditions we see in correlation to nail changes, it’s important to remember that these conditions do not apply to everyone. If you’ve discovered sudden changes in the appearance of your nails and are concerned about those changes impacting your health, we recommend visiting your nearest dermatologist to receive an accurate diagnosis of your condition.